The fragrance is not good, but it is very suitable for dry skin. I like it very much. I've been using this cream all the time. This cream is very moisturizing and suitable for winter.It absorbs quickly.My face is much softer after using this cream.I love it and i will buy it back. This is my top one. Highly recommended. I love it, it is perfect for dry skin. This cream is thick and needs massage to help absorb. It is esay to absorb and will not make the skin oily next morning. I like to use it with the parsley seed serum. This is a very good product. Smells good, absorbs very quickly. It is safe for eye areas so I just skipped the eye cream... Big bottle and reasonable price. Highly recommend! More moisture cream, because I was mixed skin, I feel in the morning using the more greasy. By night, then absorbed into the skin better, the next day the skin looks good. This is my re-purchase. I had the 2.10z before then decided to have the larger size for my second purchase. My skin is dry and dull, this cream can moisturize my face during winter time. Although this cream is rich and a little bit greasy the moment you apply, your skin can absord it in a second then you will feel the moisture and it won't be too oily. Before using this cream, I used other moisturizer which also give me enough moisture, however, my forehead will be oily every morning when I got up. 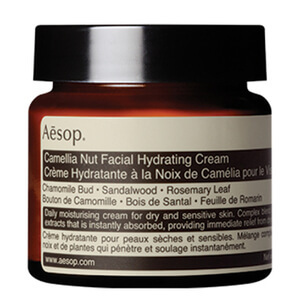 But the Aesop camellia cream balance my skin and lock the moisture during winter. This is definitely my winter favourate. I rarely ever write a review of products I purchased online, but I do so here because people who might have the same skin issues could benefit: I do have quite sensitive, slightly dry skin. I also have this natural slight red blush on my cheeks (it's not rosacea at all) which I guess for a woman is desirable to have but for a man it's not really ideal. And a general problem with well hydrating moisturizers is that it leaves a bit of a shine and produces blemishes whereas less intense moisturizers lead to dry patches on my skin. This cream takes care of all of these problems. It's quickly absorbed, gives a bit of a matte look on your skin and hydrates it really well, leaving the skin feeling soft and smooth. It also balances your skin, so my red cheeks are less pronounced and blend very well with the general skin tone. It's the best hydration I've found in moisturizers that doesn't leave your skin shiny, which is also good if you finish your skin care with a sun screen. As a tip I recommend to slightly wet your face before using it. Otherwise it is absorbed so quickly you may have to use too much of it, leading to spots due to too intense hydration. Plus, it nourishes your skin better throughout the day by locking in the water.